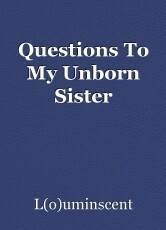 Questions I would like to ask to my oldest sister who died shortly after she was born. Rest in Power Iyanna! Wade on the other side? Lays open for just us to see? You have a brother who loves you? Taking a bullet train to where you are? In case I get handed my ticket early? I got goosebumps thinking about how your sister reaches across the veil to you. This is beautiful. Thank you! I still get chills thinking about the dreams myself.